Cheap flights to Thailand: Prague-Bangkok for €399! Etihad Airways released new promo code on their Twitter which allows you to book cheap flights from Abu Dhabi to Bangkok with AED1000 / €200 discount. Travel dates for this offer are limited to departure in November which is already start of the main season in Thailand. This offer is also valid on connecting flights from other European airports, so you can book for example return flight Prague – Bangkok for only €399 / 10132 CZK! This offer is valid only on flights EY403 and EY404. To get the promo code, click on the button below and then enter it in the booking form on the Etihad’s website. 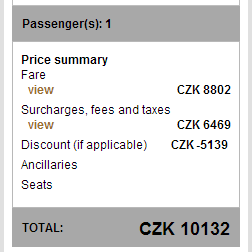 This price of course includes 23 kg of checked in luggage. Book online directly at Etihad! « WOW! Etihad Airways €200 off promotion code 2013!